Mahindra's plonks the 102PS version of its 1.5-litre, three-cylinder motor into the TUV300. Does it make the sub 4-metre SUV more desirable? It is no secret that the Indian car buyer’s penchant for all things SUV has hit a new high with sub 4-metre SUV-esque cars. What’s interesting is the fact that manufacturers are equally frenzied about offering them to buyers. India’s favourite SUV maker, Mahindra has been at it too, launching as many as three ‘SUVs’ in the segment over the past year, across various price brackets, obviously to cater the needs of various sets of buyers. The TUV300 is the one that caught my attention though, with its muscular design. It looks the way an SUV should – imposing yet appealing. Admittedly, 85PS of power from the 1.5-litre three-cylinder engine was a bit of a downer though. And when Mahindra plonked the same motor into the NuvoSport, albeit with a higher output of 102PS, the question was obvious – why not offer the engine in the same state of tune in the TUV300? Mahindra has done just that. So now TUV300 buyers can choose from the 85PS and 102PS versions. Only the top of the line T8 variant is on offer with the higher output though, and that includes both – the 5-speed manual and AMT equipped versions. 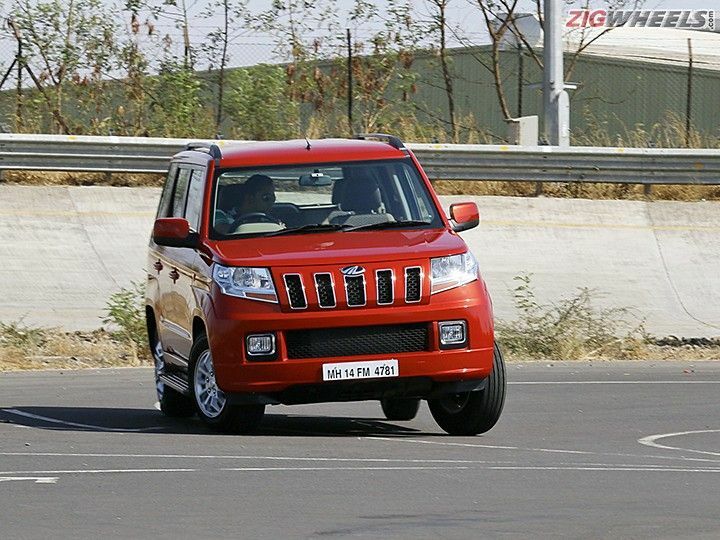 The manual version is what we got to test drive briefly, at Mahindra’s own test track at Chakan near Pune. So what’s new you ask? Nothing visually. In fact if you were to take the mHawk100 badging off the front fender there’s no way to tell the 80PS version apart from the 100PS version, from the outside. The only change inside is the additional length of the seat bottom for the rear passenger bench, which is now longer by 30mm. The height of the underseat padding has been increased by an additional 19mm as well, for better under thigh support. This has been done basis feedback from customers, and the good thing is the change isn’t limited merely to the 102PS version. Coming to the engine, the 1.5-litre three cylinder now offers peak outputs of 102PS of power and 240Nm of torque, 17PS and 10Nm more than before. The improved performance is not discernible from standstill though – performance of both versions is the same at the fag bottom end of the rev range. Driving the 85PS and 102PS versions back to back helped me confirm the same. The higher pulling power of the 102PS version is noticeable as soon as revs start climbing though. It’s the midrange and top end performance that’s the most obvious, as the 102PS version feels quicker in terms of in-gear acceleration, especially once you close in on the 100kmph mark. The improved performance should make overtaking a lot easier, especially on highways where one usually tends to cruise at 80kmph or higher. The torque spread is also wider on the 102PS version, as peak torque is available from 1500rpm up to 2800rpm, as compared to lesser powered version where the torque curve peaks at 2250rpm. This should make cruising more effortless as well. As before, the engine feels smooth and refined, with NVH levels well-controlled at normal revs, though it tends to get noisy at high revs. The improved performance obviously comes at the expense of efficiency, a small one though. Claimed fuel efficiency for the 102PS version thus stands at 18.05kmpl, as compared to the 85PS version’s 18.49kmpl. Apart from the engine, the more powerful TUV300 is absolutely identical to the 80PS version. Which means ride quality is good, though it comes at the expense of some body roll. Space is good as well, including leg and knee room for the second row. The jump seats at the back are good only for short jaunts, and wouldn’t be too comfortable for extended drives. On the whole, the added performance helps enhance the TUV300’s image as a compact yet burly SUV, and does improve its appeal for someone wanting an SUV as his daily driver. Interestingly, the 102PS version costs a mere 8000 rupees more than the 85PS version. Its manual version has been priced at Rs 8.98 lakh ex-showroom New Delhi, while the AMT equipped, 102PS TUV300 costs Rs 9.72 lakh. That, in my opinion is a steal, since for the additional 8000 rupees you get extra performance that’s usable on the go, without having to actually sacrifice fuel efficiency. Share your experiences with TUV 300?